I’m so delighted to share my Twenty Gypsy Women You Should be Reading with everyone In honor of Roma and Traveller History Month,. Gypsy culture is vastly misunderstood and underrepresented, and literature is a beautiful way to discover it. You may not have heard of many of these writers before but they will astound you with their talent. Happy reading! St. Sarah, Kali Sara, Sara Kali, Sara-la-Kali, Sati-Sara, The Black Madonna, The Black Mother… many names for one Goddess-Saint sacred to Roma all over the world. Today is her festival– she is the Goddess of Fate, good fortune, fertility, and protection– and Roma honor her in pilgrimage, by worshiping her statue, through dance and community… so many ways, so many incarnations of the goddess who accompanied the Roma all the way from India. Take a look at these articles below for more information about the Goddess-Saint, Romanipen/Romani religion/spirituality, and her celebration. Be sure to click the links for the whole articles. 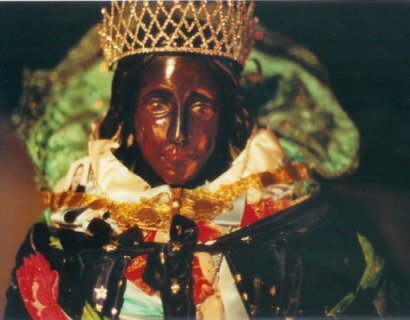 “Until recently it was widely believed that this worship of Kali Sara, the Romani Black Madonna or Goddess was unique to Les Saintes Maries de La Mer. 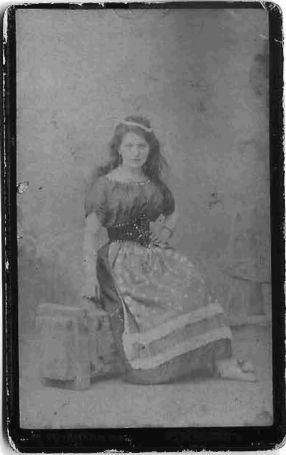 My own recent research among Romani refugees from the Czech Republic, Slovakia, Poland and in countries of the Balkans has uncovered the little-known fact that other Black Virgins are worshipped by Roma in central/eastern Europe and that Roma from these countries perform similar rituals. These rituals include laying flowers at the feet of the statue, adorning the statue with clothing of the sick hoping for cures, placing requests to the statue, and lighting candles to the female divinity. To the Roma, Kali Sara is the Protectress who will cure sickness, bring good luck and fertility and grant success in business ventures. The Romani ceremony at Les Saintes Maries, as elsewhere, consists of carrying the statue on a platform strewn with flowers (4) into the closest body of water such as a sea, lake, flowing river or even a large pond of clear water. The platform is then lowered to touch the water while the crowd throws flowers into the water. Indian scholars such as Dr. Weer Rishi (5) and others who have witnessed this Romani ceremony, as well as Western observers who are familiar with Hindu religious customs have identified this ceremony with the Durga Poojaof India. 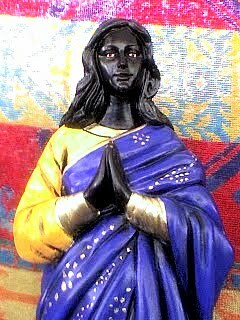 In Romani, Kali Sara means Black Sara and in India, the Goddess Kali is known as Kali/Durga/Sara. Like the Hindus, the Roma practice shaktism, the worship of Goddesses. 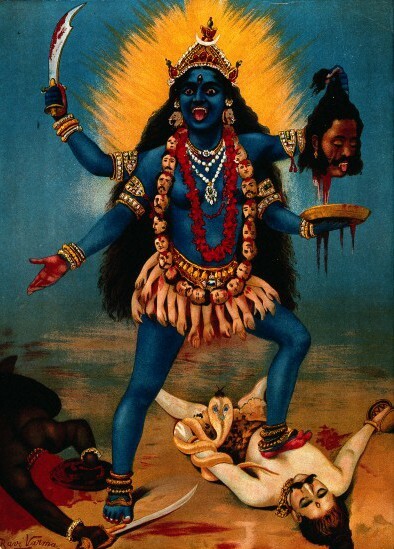 In other words, the Roma who attend the pilgrimage to Les Saintes Maries in France and in other related ceremonies elsewhere honouring black female divinities, are in fact continuing to worship Kali/Durga/Sara their original Goddess in India. tu as vécu en ce lieu des Saintes-Maries-de-la-Mer. Tu es venue d’un lointain pays au-delà des mers. te confier mes peines et mes joies. Je te prie pour tous les membres de ma famille et tous mes amis. Read the interview “Tatiana Eva-Marie on the harmonious fusion of Romani ‘Gypsy’ music” in Quail Bell Magazine and find out what she has to say about Romani music and representation, how her multicultural heritage shapes her art, growing up in theatres and concert halls all over Europe, the Music Explorer competition/documentary (click the heart to vote for her! 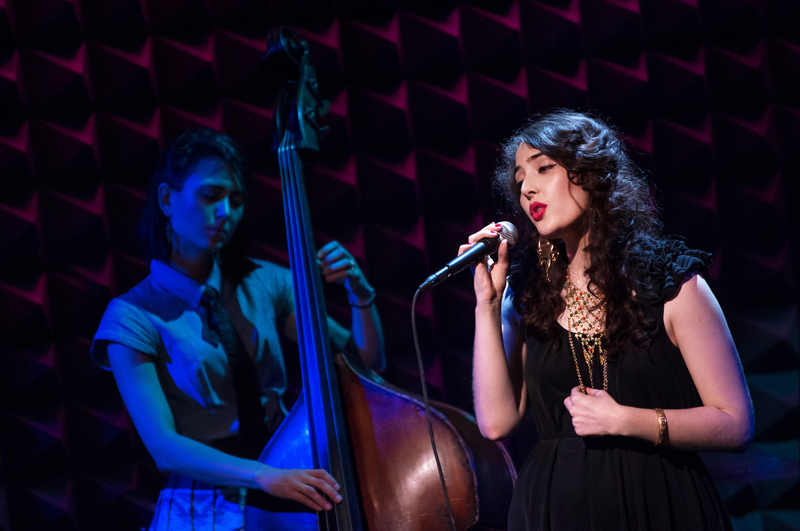 ), and her life in the Avalon Jazz Band in New York City. You can also listen to some beautiful songs from the competition. JR: How do you think the Romani arts scene can support the fight for Romani rights and representation? TEM: By showing an open and generous culture, not magical creatures, not chicken thieves, but real people. I suppose it is somewhat natural to be afraid of foreign things, but in the age of internet and communication there can be no excuse for that anymore. We are all so mixed now and most people can trace their heritage back to more than one country. We should all embrace our differences and be proud of our origins. We should try and educate the people around us, share our knowledge with each other. Art is a wonderful way of doing that and has always been a bridge between people. I found all of these gems of the Lolo Diklo Facebook page— “like” for more about current Romani news, activism, arts, and culture. 1. A Travelling girl’s story: the struggle against eviction and her kickstarter to fund her education. Her video shows what it’s like to be a Traveller girl in England trying to better herself in spite of the daily persecution that Travellers and Roma face. 2. Romedia Foundation led a summer camp workshop for young Roma from Szendrőlád (a small settlement in North-Western Hungary) in the summer of 2012, as part of the “Youth in Action: Strenghtening the Voice of Roma Youth” project. The summer camp was organized by the Bhim Rao Association. The workshop held by Romedia had as its aim to bring to life different film creations, developed and carried out entirely by the young Roma participants, numbering approximately 30 teenagers. The workshop held by Romedia had as its aim to bring to life different film creations, developed and carried out entirely by the young Roma participants, numbering approximately 30 Roma teenagers. 3. Pablo Vega is a Spanish Romani film-maker. His love of cinematography grew in time and he eventually started his own production company called “DIKA” which in Romanes means “SEE”. His first documentary is called “Romnia” in which he documented the life of four Roma women living in Huesca aiming to reflect another reality of Roma women, breaking the stereotypes so often present in society. Women who have struggled to get where they are trough education, women of different ages portraying similar realities. An array of fascinating videos, radio programs, and articles! Over the weekend the class read Dr. Ian Hancock’s article “Duty and Beauty, Possession and Truth: The Claim of Lexical Impoverishment as Control,” on Romano Kopachi, an excellent website on “Romani culture from a Romani viewpoint” by Ronald Lee, Romani activist, author, lecturer, and journalist. Dr. Hancock, a linguist at The University of Texas, Austin, reveals a startling amount of falsified claims about the Romani language by writers and even other academics, including criminology and anthropology textbooks. Can you imagine falling in love without any concept of ‘duty,’ ‘possession,’ ‘truth,’ ‘beautiful,’ ‘time,’ ‘danger,’ ‘warmth,’ ‘quiet,’ ‘God,’ ‘soul,’ and ‘immortality’? Love is one of the most humanizing emotions or states-of-being. When we love, we are relatable– we are understood. Of course, those words and concepts do exist in the Romani language, but people outside the culture continue to deny this. Read the rest of Hancock’s article for more about that. Maybe Harry Potter doesn’t seem like the obvious choice here, but stay with me. The film that this clip is excerpted from, part two of The Deathly Hallows, deals mainly with the terror of genocide (the eradication of muggle-born witches and wizards) at the hands of a militant, Fascist uprising (the Death Eaters and Voldemort). And at the most crucial moment of Harry’s quest to defeat Voldemort, his mentor, Dumblebore appears to remind him that “words are… our most inexhaustible source of magic.” And its true. Nations rise and fall on words, religions and cultures are built and lost through words, every civilization takes shape through language, stories, and beliefs. And now, coming back to the topic du jour, what people write about other cultures matters, and it matters quite a lot. Just as it is harmful and dehumanizing to present Romani characters in film and TV as functional criminals or spell-casters time after time, it is dehumanizing (and incorrect) to suggest that the Romani people have no concept of truth, beauty, possession, and time. When these stereotypes and misconceptions are perpetuated by the media, in pop culture, and by authors, it implies that Gypsies are somehow inherently deficient, and Romani persecutors have used that as an excuse to justify antigypsism for centuries. The films you’ve chosen to analyze probably deal with “impoverishment” in the Romani culture/community in some way. It could be “lexical impoverishment,” as discussed in the article, or it might be moral, intellectual, or emotional impoverishment. It could even be economic impoverishment. Write down all of the implied Romani “impoverishments” in the film you’ve chosen and think about what it implies about the Romani community and/or the non-Romani community in the film. Does it make Romani people seem more or less sympathetic? More or less human? More or less stereotypical? How or why? For this week’s blog post, write a 300 word analysis of the impoverishments that you’ve noticed and relate it to your argument. If you are working on refining your thesis statement, this post could help you revise it. 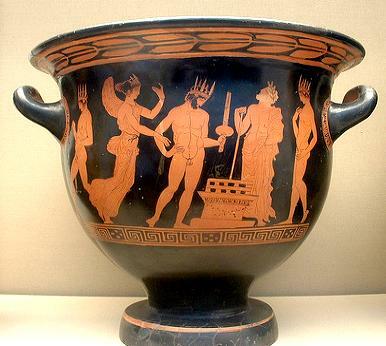 If “truth and beauty” are the cultural pillars of Western civilization, the false accusation that Romanies don’t have these concepts is particularly dehumanizing. “How to eat like a real Gypsy” in the Daily Meal for Roma & Traveller History Month. Learn to cook like my Gypsy grandmother taught me, plus, tea leaf reading! 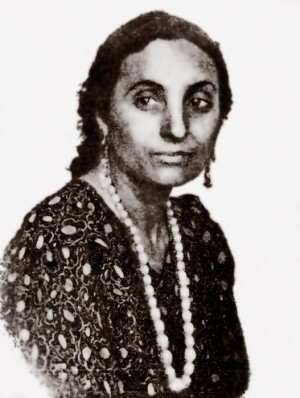 June is Gypsy, Roma, & Traveller History Month!